This is the most current view of the stadium, with full color detail of Fenway Park. 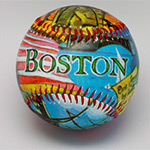 This printed baseball has a detailed painting of Fenway Park printed on it. 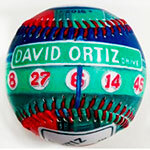 One panel of the baseball has inside field view of the stadium, including billboards and stadium seats painted in full detail. Other panel of baseball has view of outside stadium where the name Fenway Park is located, exactly as it is shown on the real building. The artwork is by Emily M. Wolfson. Includes a protective, clear lucite display box and certificate of authenticity.